A state worker who provides mental health services is pictured in an advertisement paid for by the SEIU1199. The ad describes the services state employees provide. Though all indications are that many state employees will receive pink slips soon, several factors make it difficult for Connecticut to downsize its workforce. And those same factors and others make it all-but-impossible to close the major budget deficits projected for the next few years with layoffs alone. Federal mandates, surging overtime costs, anti-privatization provisions in labor contracts, competing policy objectives, political pressure and even the high cost of laying off staff, all will limit any effort to shrink state government quickly and strategically. The governor has sought — but not received — another round of concessions from state workers. His budget director has said the state needs “thousands of layoffs” to help balance the next state budget, which begins July 1. Nonpartisan analysts say there is a built-in hole of about $900 million in next year’s finances, and a much larger gap, topping $2 billion, in the 2017-18 and 2018-19 fiscal years. But union leaders say their members granted concessions in 2009 and 2011, and that Malloy and legislators need to boost taxes on wealthy households and corporations — something Malloy and legislators from both parties oppose this year. Luciano and other labor leaders also have warned that layoffs are not a budget-balancing panacea, and argue they won’t produce a savings that will make the corresponding loss of services worthwhile. Depending on the union involved, workers must receive two to eight weeks’ notice. Because the first two weeks of all state workers’ salary is withheld and not paid until they end employment, that expense also must be met. Accrued vacation and compensatory time must be paid. Payments to the Unemployment Compensation fund increase. Pension fund contributions still must be made. As Connecticut slipped deep into The Great Recession in November 2009, Gov. M. Jodi Rell’s administration argued that layoff savings generally aren’t as large as many people might assume, even after all buy-out costs have been met. The administration projected the potential savings from laying off 5,000 workers — roughly 1/10th of the state workforce at the time — at $300 million to $370 million. Former Gov. M. Jodi Rell, who decided against layoffs. Rell did not issue pink slips. Another cost that eats away at layoff-related savings is overtime. Under Malloy, the number of permanent, full-time employees paid for out of the state budget is down to about 45,000. The Malloy administration already is facing criticism from legislators — particularly Republicans — that spending on overtime is too high. About $220 million was budgeted this fiscal year to meet that cost. GOP lawmakers insist this could be tightened somewhat simply by better personnel management. But union leaders say staff shortages, particularly in the departments of Correction and Social Services, only would be exacerbated by layoffs. One of the biggest challenges Malloy faces involves limits placed by federal rules and contractual language. Under many circumstances, the state effectively is barred from laying off workers. For example, many of the larger unions have contract language prohibiting layoffs if they are being done to privatize services. In other words, eliminating or reducing a service is one thing. But if state jobs are to be cut while the services are to be retained — and turned over to a private contractor — that’s a problem. The administration currently is negotiating wage and working-condition contracts with more than a dozen bargaining units, and the governor could seek to eliminate such restrictions. But if the unions resist, the matter could end up in arbitration. Further complicating matters, the network of community-based private, nonprofit agencies that provide the bulk of state social services now insists a combination of funding cuts and surging demand is pushing the safety net to its breaking point. If the state is going to privatize the remainder of its social services, this network will need more funding. When Malloy unveiled his plan on Feb. 3 to re-balance the 2016-17 fiscal year — a plan that already is more than $330 million in the red because of eroding revenue projections — the head of a coalition representing 550 community-based nonprofits warned the funding in his package was woefully insufficient. “The budget proposed by Governor Malloy this month already calls for … cuts that would devastate life-sustaining programs for thousands of Connecticut residents, said Jeffrey Walter, interim CEO of the Connecticut Community Nonprofit Alliance. Gov. Dannel P. Malloy telling reporters last week that the state’s workforce must shrink. Similarly, the federal government presents another legal barrier. Connecticut’s Department of Children and Families, which is responsible for the care of thousands of neglected or otherwise abused children, has been under the eye of a federal court monitor since 1991. The monitor provided state officials in January with data showing unreasonable caseloads for social workers and excessive wait lists for services such as domestic violence and substance abuse treatment. The number of children who have to wait for services has increased, while DCF spending has fallen by $59.4 million, or 7 percent since 2009. Agency staffing dropped by 306 employees, or 9 percent, over that period. The Department of Social Services faced two federal class-action lawsuits in recent years alleging that it had failed to meet federal timeliness standards for processing applications for Medicaid and the Supplemental Nutrition Assistance Program – the program formerly known as food stamps. One of the suits tied delays in processing Medicaid applications – which the lawsuit said left people who qualified for the program going months without needed care and medications – to a shortage of staff in the department. As part of a 2014 settlement, the state agreed to meet certain benchmarks for timely application processing. Although the settlement did not require specific staffing levels, the department determined it would need to hire additional workers to comply. 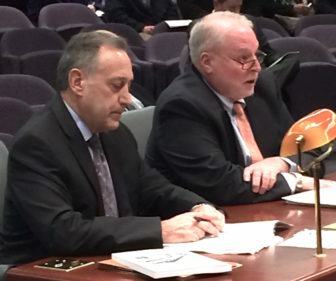 Judge Patrick L. Carroll III, right, chief court administrator, testifies recently on proposed cuts to the judiciary. At left is Tom Siconolfi, executive director of administrative services for the Judicial Branch. Judge Patrick L. Carroll III, the chief court administrator, told legislators in February that the governor’s budget proposal for 2016-17 would translate into hundreds of layoffs in the Judicial Branch and force the closure of multiple courthouses and a juvenile detention facility. This would devastate Connecticut’s court system so severely that it would “compromise access to justice for our citizens” and possibly leave the branch unable to meet all of its constitutional obligations, he said. The cutbacks also almost certainly would undermine anti-recidivism programs, such as Malloy’s “Second Chance Society” initiative, Carroll said. But Second Chance Society might not be the only policy objective weakened or undone by layoffs. 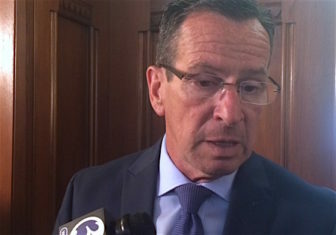 Shortly after winning re-election to a second term in November 2014, Malloy announced he would pursue a major investment in transportation to transform Connecticut’s aging, crowded network. But the Department of Transportation has just over 3,000 full-time employees. That’s about the same the level it had six years ago when the legislature’s Program Review and Investigations Committee concluded it lacked adequate staff to complete projects on time and under budget. According to the last monthly report from state Treasurer Denise L. Nappier, Connecticut has more than $3.2 billion in approved transportation bonding that it still has not issued and spent. Transportation advocates attribute that backlog, in part, to a lack of transportation planning staff, which translates into an inability to launch projects in a timely fashion. That stranded bonding is almost double the $1.7 billion backlog that existed when Malloy first took office in January 2011.